John Hopkins has signed a two-year deal with the Kawasaki MotoGP team, starting next year, after quitting Suzuki. The 24-year-old, who is fourth in the championship standings, earned the first podium place of his career in May when he finished third in China. "We've had our eye on him for some time," said Kawasaki team manager Michael Bartholemy. "A year ago we weren't in a position to attract a rider of his calibre, but the situation is very different now." 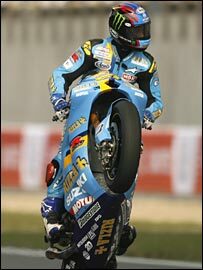 Bartholemy also said he hoped to sign a more experienced rider to line up alongside Hopkins, with Ducati's Loris Capirossi being tipped to make the move. "We have proved that Kawasaki has a professional set-up and a competitive package which is why we now have the option of also signing a proven MotoGP race winner to ride alongside John next season," he said. Suzuki team chief Paul Denning said it was "disappointing" to lose Californian rider Hopkins. "There are reasons for that other than performance," he said. "I think there are commercial reasons but it's not really our job to be concerned about that. "We'd have been very, very happy to continue with John, we are disappointed he is leaving but you have to look at it as an opportunity rather than a problem." Denning warned off any rivals who may be looking at signing Suzuki's remaining rider, Chris Vermeulen, saying their intention to re-sign the Australian was "very, very clear."